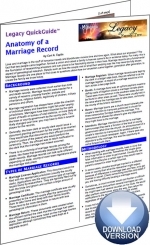 The�Anatomy of a Marriage Record�Legacy QuickGuide™ contains valuable information on how to interpret the data in a variety of marriage records including marriage license applications and marriage registers. This handy 5-page PDF guide can be used on your computer or mobile device for anytime access. 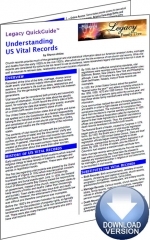 The Understanding US Vital Records Legacy QuickGuide™ offers an overview of how the collection of vital records (births, marriages and deaths) evolved; definitions of the various vital records; descriptions of the important genealogical information to be found within each of the vital records; how jurisdictions vary in the rules and regulation for obtaining copies of vital record and listings of where to locate copies of what we think of as today’s vital records (birth, marriage, divorce and death). This handy 4-page PDF guide can be used on your computer or mobile device for anytime access.